MOUNT ONTAKE –– Five more lifeless bodies have been found on the slopes of Japan’s Mount Ontake, bringing the total number of presumed dead in a volcanic eruption Saturday to 36. Twenty-four bodies still remain on the mountain, while 12 have been recovered, identified and pronounced dead, Nagano Prefecture Police said today. Plumes of smoke and ash rise as over Mount Ontake in central Japan on Saturday. The search for more missing hikers has been suspended due to dangerous conditions at summit. Hydrogen sulfide gas is being spewed from the mountain, police said, putting rescuers in danger. a sound like thunder when the eruption began. Relatives of the missing gathered near Mount Ontake over the weekend desperately seeking information. Among them was Kiyokazu Tokoro from nearby Aichi prefecture, whose son Yuki was hiking on the volcano with his girlfriend. He said he knew they were near the summit at the time of the eruption because his son’s girlfriend had sent a photo to a friend minutes beforehand. More than 350 rescue workers –– a mix of police, firefighters and military personnel –– began climbing two separate routes up the mountain yesterday morning, authorities in the nearby village of Otaki said. They said they observed 17 to 20 inches of volcanic ash covering the ground in some areas. to not approach the volcano, the summit of which is at an altitude of 10,060 feet. 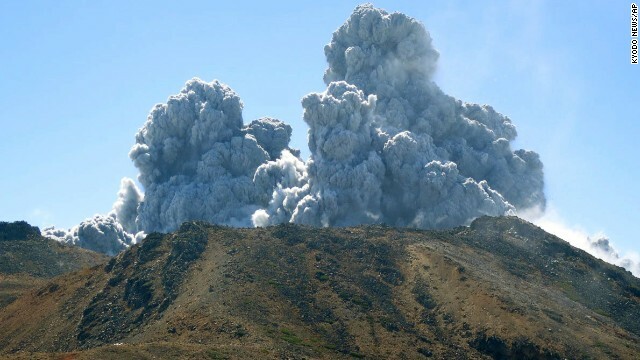 The agency warned that another large eruption could take place in the next six days or so. Small continuous eruptions continued yesterday. The volcano’s plume of smoke and ash was reported to have disrupted air travel in Japan, causing delays at several airports. Mount Ontake, the second tallest volcano in Japan, after Mount Fuji, is a popular destination for hikers, especially in the fall when the foliage’s rich autumn colours are on display. The last major eruption of Mount Ontake, which is about 125 miles west of Tokyo, took place in 1979, according to the Global Volcanism Programme at the Smithsonian Institute.